Since Pasadena is rich in history and fine historic buildings, it seems logical for me to do a series on interesting homes. The first was the Boddy House in nearby La Canada. Now, I’m visiting the Orange Grove area of Pasadena proper. North of the freeway is the Fenyes Mansion, a Beaux Art home built by architect Robert D. Farquhar in 1905 for Dr. Adalbert Fenyes and his wife, Eva Scott Muse Fenyes. This is Eva’s house; it is a woman’s house. As you enter the front door, Eva’s portrait hangs on the wall to your left. Eva wanted a modern house so it was built with the new electric light system. The style, however, was Victorian, as was Eva. The furniture is heavy and the house somewhat dark. The windows face east and add light. The heavy velvet draperies, the chandeliers, and the carved straight-backed chairs look Victorian to me. 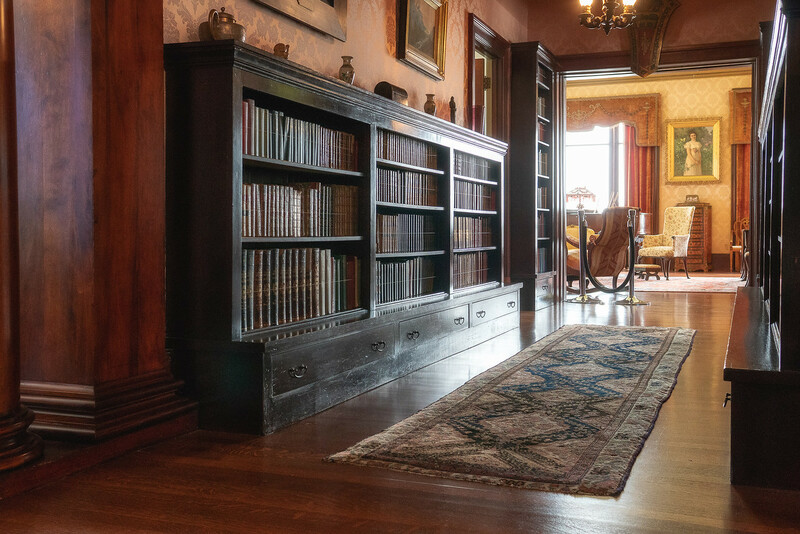 The docent-led tour covers the ground floor of the mansion. Here the rooms retain the original furnishings, flooring, carpets, and paintings. The upstairs rooms have been renovated and updated over the years to accommodate the family. 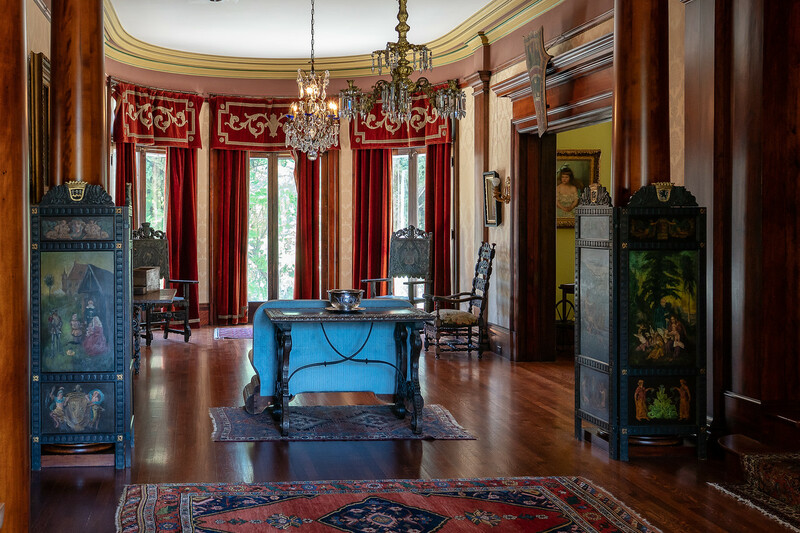 The Fenyes mansion remained in the family until 1970 when it was deeded to the Pasadena Historical Society. We weren’t allowed to touch anything and were instructed to wear protective coverings on our shoes. Our tour wandered from room to room marveling at Eva’s creation. She was a talented woman, a masterful watercolor artist. 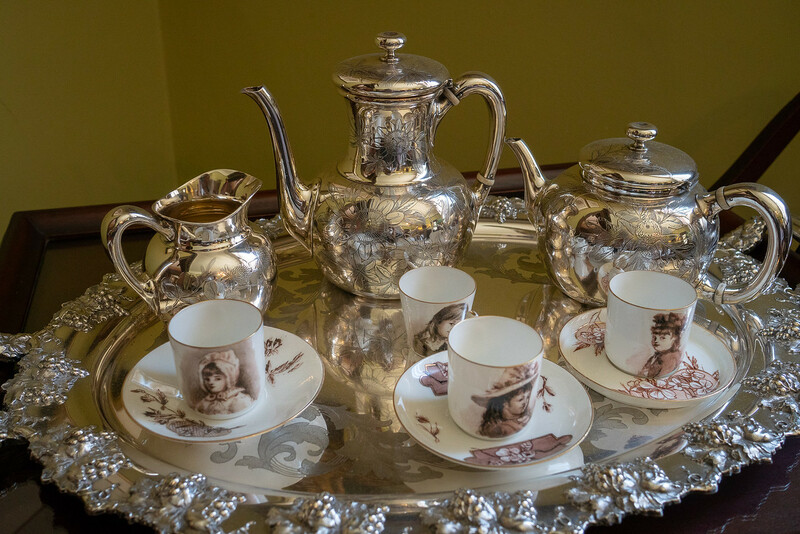 Eva decorated the tea set on display in the dining room. Each cup is different and represents one of her daughter’s friends. There may have been more cups to the set, but these few are all that were on display. A long hall connects the reception area to the drawing room. This became the library. I glanced at the titles, but there wasn’t anything that looked like fiction. Eva and Dr. Fenyes were fluent in several languages. That didn’t help me with my search! At the end of the hall is the drawing room. Chairs, many of which have little footstools so that the ladies modestly can tuck their feet under their skirts, fill the room. This is a big room, running from back to the front of the house. There is a Steinway there so music must have been an entertainment. Evidently, this elaborate style for shades was popular in the early 1900s. There were several of them in the house. 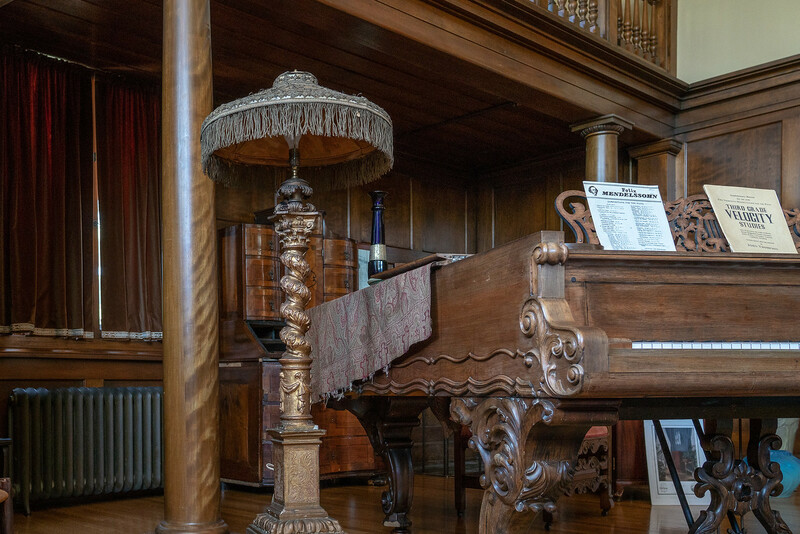 In 1911, the family built, with the help of architects Marston & Van Pelt, an addition to the north end which created a conservatory, an office/laboratory for Dr. Fenyes (an entomologist as well as a physician) and a studio room for entertaining. I love this extra room! It has a large open space where one could set up more chairs for a lecture series. At one end is a stage where the family could put on plays. At the opposite end is a huge fireplace. Portraits adorn the walls. It is a marvelous room. Another silk lampshade next to another grand piano, both near the stage area of the room. I greatly enjoyed my visit to the Fenyes Mansion. The story of Eva, her daughter Leonora, and her granddaughter Babsie alone are worth the price of admission. 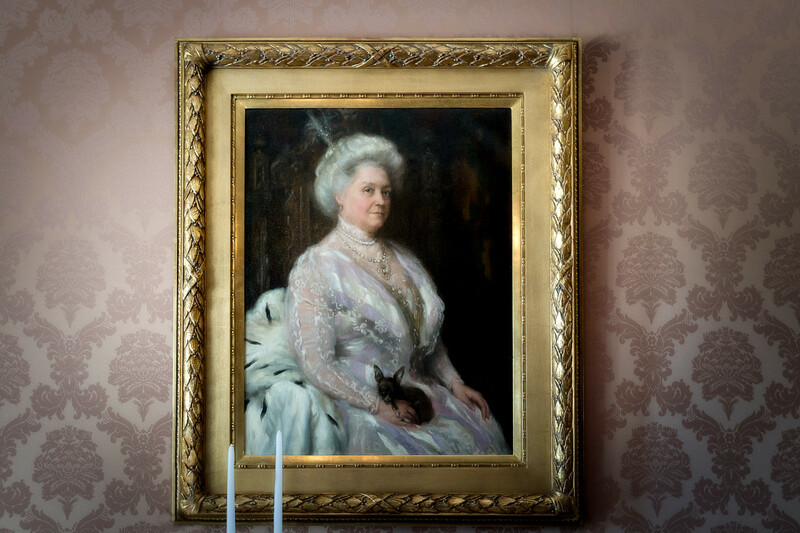 These women were key players in the creation, running, and preservation of Fenyes Mansion. The mansion is open to visitors Friday through Sunday. 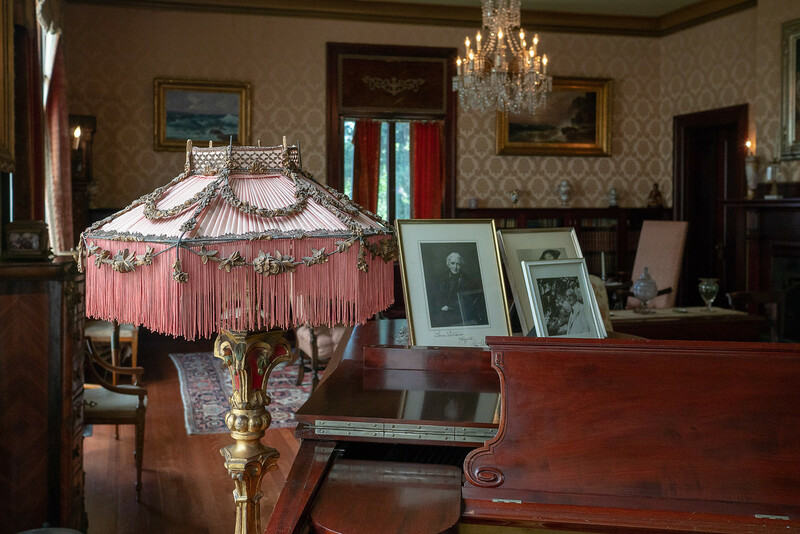 The tours are led by a docent and tickets are purchased through the Pasadena Museum of History. Events are held at the mansion, but I believe these are only in the garden area. The house is too valuable and delicate for weddings and such. The Museum of History is next door to the mansion. There is also a replica Finnish lodge (the Finnish Folk Art Museum) that one can tour. To see more photos from my time at Fenyes Mansion, please click here.